I am a member of the Budgerigar Association of America's Judges Association, currently the Judges Administrator. 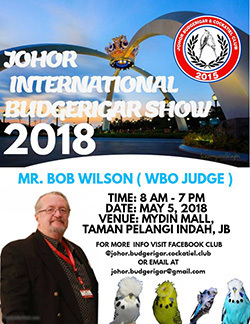 Also on the WBO (World Budgerigar Organization) International Judges Panel. Previously, before taking a break from the hobby, I was on The American Budgerigar Society's Judges Panel from 1993 thru 1999 and the BAA Judges Association 2000 - 2006. I have been fortunate to judge many of the top shows in the U.S. including an ABS All American, the first Grand National hosted by BAA, and the thirteenth Grand National in Houston 2012. Judging is an aspect of the hobby I really enjoy. It's always good when you start the day knowing you will make a few people happy..LOL... It provides an opportunity to give back to the hobby, do a little educating, see top birds in different areas of the U.S. and other countries, and meet new friends in the process. 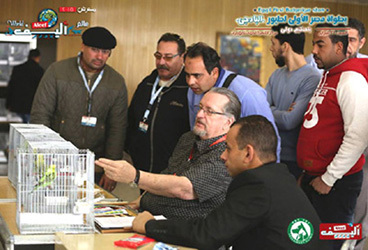 Judging the first National Budgerigar Championship in Egypt. 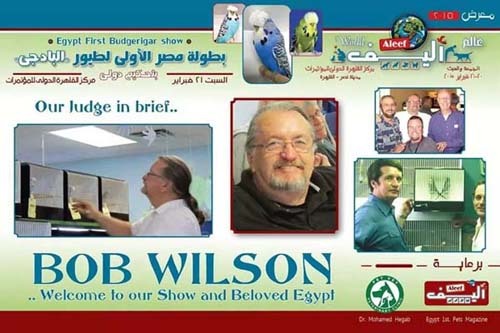 Early 2015 I was invited to judge The First National Budgerigar Championship Show in Cairo, Egypt. A great opportunity to travel to "The Land of Pharaohs", meet the budgie breeders and judge their birds. Excited exhibitors waiting for the show to commence in Cairo. Ahmad Soliman El Aggan, Moheb Mabil Boules, Dr Mohamad Hegab and their team really know how to use social media to promote a show. Ahmad publishes several magazines including one that focuses on pets, including budgerigars and lovebirds, both very popular in Egypt..and also sponsors Aleef's World Exhibition where the Budgerigar Show was be held. Moheb is well known for his focus on developing a wide range of cresteds to exhibition quality... and Dr Hegab is one of the country's leading veterinarians. In 2016 I returned to Cairo to judge their National Show in April, along with Maarten Heylen from Belgium. This was followed by a Young Bird Show in Belgium in May, and shows in Arizona, Texas, Illinois, Missouri and Iowa in USA. I am available to judge shows whenever dates work with my business schedule. If you need a judge for your shows Email Me with details, dates etc. I limit the number of shows I judge each year so please email well in advance of your show.